You'll find this copy in the Guinness Book of World Records thanks to a 2001 sale for $350,000 that was brokered by Bill Hughes, from the private collection of Steve Geppi. This one's got a nicer spine than the other CGC 9.0 copy, and it has better centering than either that one or the very nice Denver copy. The back cover has a fresh look you'd never expect from an unrestored book. Many copies I've seen either have the word "The" at the bottom left running off the edge, have the red borders of the word "Marvel" at the top cut off, or are even printed much more askew than that, but none of those apply to this specimen. And while most copies of the book have a black circle printed over the "OCT." cover date with "NOV." printed above it, this is the only copy I've seen that has the OCT letters showing through and actually visible. 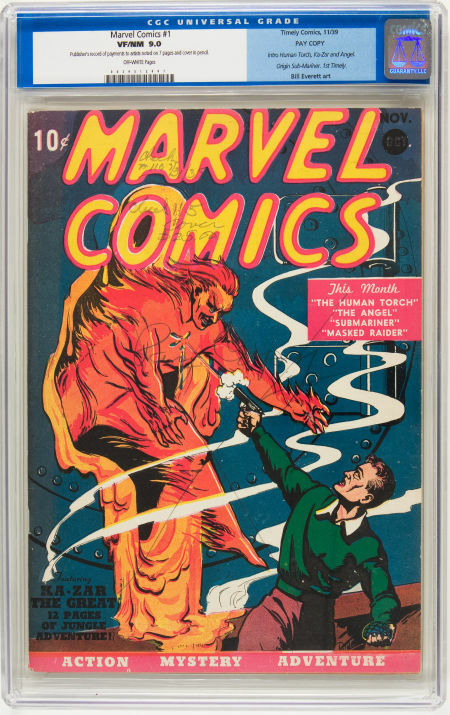 On the occasion of this copy first becoming known to the collecting world at a 1993 auction, "Many members [of the American Association of Comic Book Collectors Grading Committee] also felt that the "pay copy" represented the best known copy (whitest pages and the most perfect printed registration. Marvel Comics #1 is notorious for off-registration printing on the interior pages. ), " as Roger Hill wrote in Overstreet's Comic Book Marketplace. Gary Carter, chairman of the committee, wrote, "The Lloyd Jacquet Estate 'pay copy' of Marvel #1 impressed me more than I can say." On the occasion of the 2001 sale, Steve Borock, at the time Primary Grader for CGC, was quoted as saying, "The registration on the pages of this copy of Marvel Comics #1 is phenomenal." This is referred to as the pay copy or "payout copy" because it's the one used by the Lloyd Jacquet studio (aka Funnies Inc.), which produced the comic in its entirety for Timely, to record how much each contributor was paid, on which date and with which check number. For instance, the handwritten notation on the cover tells us that cover artist Frank R. Paul received $25 to draw this now-legendary cover. The inside look that this gives the owner at the very genesis of the Timely/Marvel line is what makes this one of the most desirable single copies of any comic book. Also noted on the interior pages are payments to Bill Everett (for the Sub-Mariner story), Carl Burgos (for the Human Torch story), Ben Thompson (Ka-Zar), Paul Gustavson (the Angel), and others, all dating from late July 1939. Yes, this comic is the first newsstand appearance of all four of those classic characters, and it's also the first comic book by Timely (later known as Marvel). As such, this is the beginning of the Marvel Universe and the entire pop culture phenomenon that that entails. CGC notes, "Publisher's record of payments to artists noted on 7 pages and cover in pencil."